CJ came down for his first desert golf experience. Also, my first taste of golf since October, almost six months! (No, the 9-hole, 7-iron round doesn’t count). So after two planned days at Wildfire, to check out the LPGA, and Southern Dunes, a favorite of mine, CJ wanted more. My wallet and wrist were hurting, but who says no to more golf? Thankfully, we got a prime spot at SunRidge Canyon. If you’d been out with us, you might even notice we were golfing. 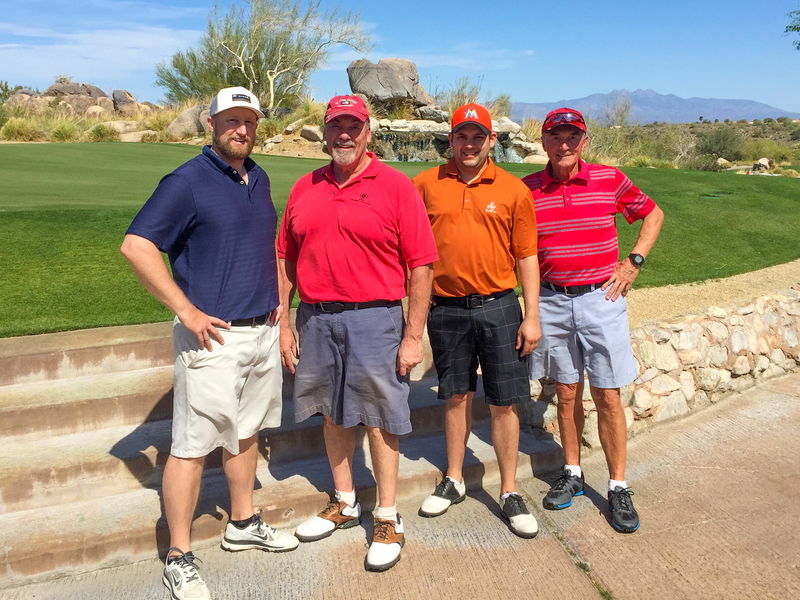 We were paired up with another twosome, Jim and Al who made the day much more fun. Jim and CJ became best friends by the third hole, carrying conversations from tee to green while Al and I watched in amusement. They’d still be telling stories mid-backswing and be just fine. 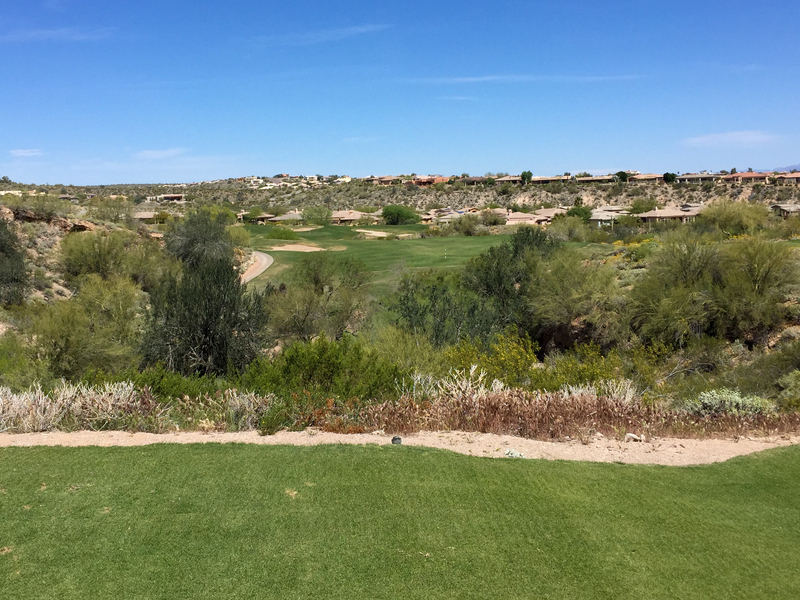 I was thankful for the company, because toward the end of the round, SunRidge Canyon features the “Wicked 6.” It is the selling point of this course, a tough 6-hole slog back up the canyon to finish your round. I laughed it off. I was wrong. The front nine opens with a friendly and reachable par 4. Reachable because it is 295 yards, slightly downhill. Friendly because there isn’t much risk to going for it aside from a front-right sand trap. I reached (after a breakfast ball) and promptly three-putted. Oops. The 402-yard 2nd is also friendly, just not reachable. And the par-5 3rd, at 510-yards, is, you guessed it, friendly and reachable. Don’t get used to it. The par-4 4th plays uphill, but with a wide fairway. The green is elevated and tough to hold, with both the front and right of the putting surface unable to hold your shot. The long, 436-yard 5th is the toughest hole on the front. How you do here might be a sign of how the close of your round might go. I bogeyed… (foreshadowing). The first of many scenic par 3s is the 179-yard 6th. The shot is intimidating as you carry the desert nearly the whole way, and it looks much longer than it reads on the scorecard. The 341-yard 7th features a split fairway. The middle section gives way to a deep wash about 220 yards from the tee. The overall shortness of the hole makes it easier to stomach laying up with an iron even. Then there’s the long, 235-yard 8th. The longest par 3, it’s not so much punishing -with a couple of flanking bunkers- as it is distant. I think I hit a 5-wood and made par. I’ll take it. The 9th closes with a par 5 while you eat a disappointing bratwurst from the halfway house that isn’t quite half way. I covered the 516 yards with a driver and 5-wood for a birdie. The rest of the group did not fare as well, all posting doubles or worse. There is a lot of trouble on the way to the green. A wash, desert, fairway bunkers and probably other things I tried not to remember. The back side opens with another short par 4. At 301 yards and slightly uphill, it’s no cakewalk like the first, but with the right bounces it can be tracked down. There is a deep bunker in front of the green that makes rolling on hard, and overall it is much more risk/reward than the opener. I launched my ball into a house, should’ve laid up. 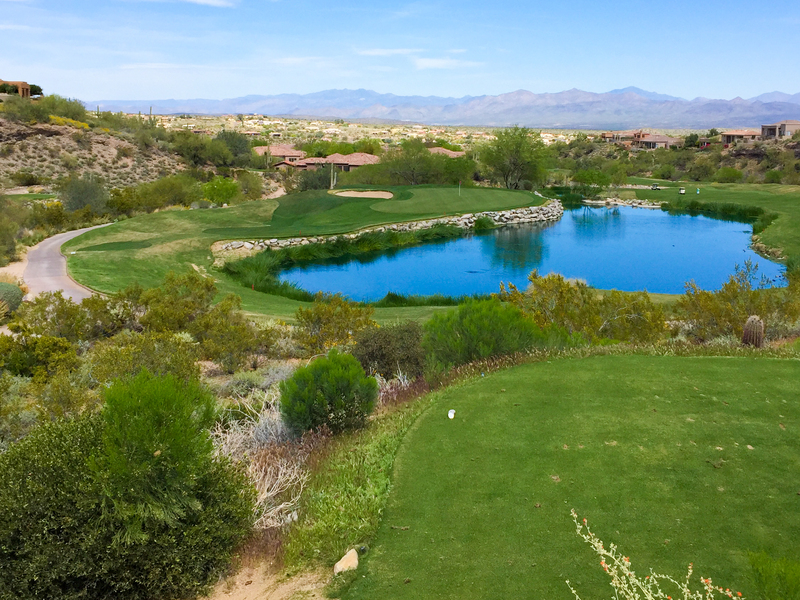 It’s a gorgeous hole off the tee, with a scenic lake to carry to the fairway. The 11th is another par 4 bisected by a desert wash. Only on this 408-yard hole, there are not cacti or desert shrubs to swallow your ball into oblivion. There is, however, a stone wall that grows taller as it moves left to right, from about 6 inches to maybe 5 feet. I played from the wash on the left side. CJ played from the right side, needing to pitch it backwards (barely) and then barely clearing the wall with an 8-iron. He doubled the hole; I made par. The lesson is: aim left. The twelfth is a par-3 similar to the 6th, but twenty yards shorter and without the valley vista. The bunker on the left is a tough up-and-down. And then you get to the brutal third of SunRidge Canyon. It even has its own name, branded the Wicked 6. As you’ll see, I thought it was all just a marketing gimmick and did not play it with the proper respect. Let this be a warning. The last six holes feature a couple of each type of hole, par 3’s, 4’s and 5’s. The first is a 544-yard par 5 that plays uphill. Anything that’s not a par 3 on this stretch does go uphill, into the wind, as you climb the canyon back to the clubhouse. As for difficulty, it really just plays long. With two well-struck shots, a simple approach waits. But the green is deep and you’ll want to be within twenty to thirty feet to avoid a guaranteed three-putt. Unless you’re Jim, who ran home a putt from way downtown, curling in the backdoor. I wish he would teach me that skill. The 160-yard 14th is no cakewalk. Water guards the entire front and right of the green while a bunker cuts into the left. It will need to be your most accurate short iron of the day. Also, the green has a nasty dip on the left that is not easy to putt out of. The par-4 15th, at 439 yards is the longest of its type on the course. The fairway slopes into the bunkers on the left, and from there it is still a long way in. The last par 5, at 515 yards, seems simple. The green is well-protected and the layup shot is tough, with another wash to navigate. The closing 18th is a dogleg left to an elevated green 400 yards away. Also, plenty of danger. 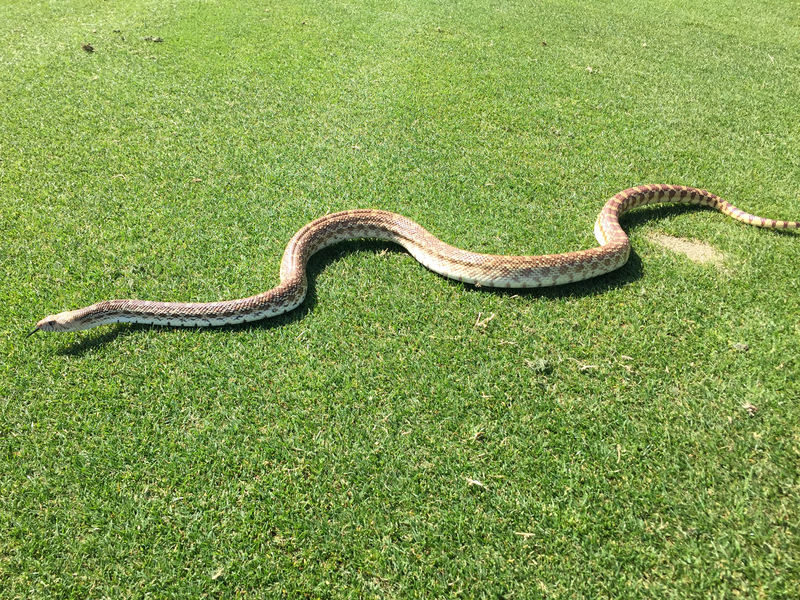 Why you could come across a four-foot snake! 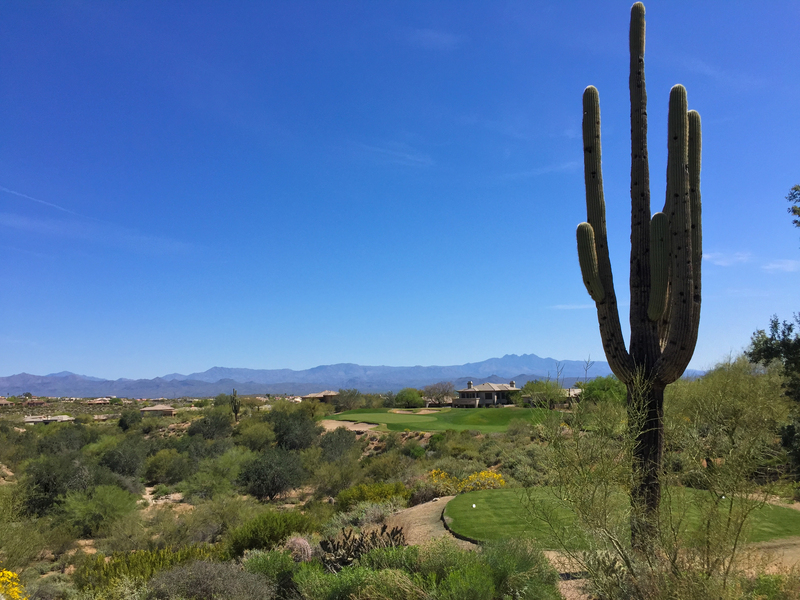 I’m glad we came out to SunRidge Canyon for the final round of a three-round weekend. It was definitely the best value of the weekend and had views and beauty that were visible on every hole. The Wicked 6 is definitely as tough as advertised. The last six holes could easily be rated the six hardest holes on the course. Tack on that you’re usually a few beers in by then and the sun has chipped away at your SPF 15, and you’ve got a recipe for disaster. I started the day +2 through 12 holes and played the last third in +9. It got ugly. I can’t complain though. It made for a great afternoon, a challenge that made me want to come back for more, and I enjoyed the company. The final par 3 is my favorite view off the tee. 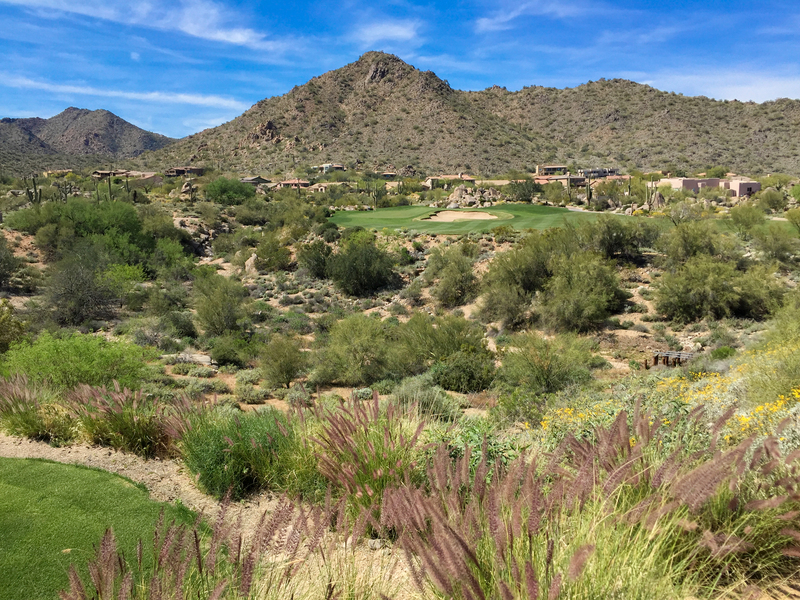 Set against the backdrop of some rocky hills, the green looks extra tiny from the tee. Like a tiny oasis in a vast land of desert vegetation. My tee shot carried, and carried, and carried some more. It then hit a boulder behind a green and settled behind another rock. 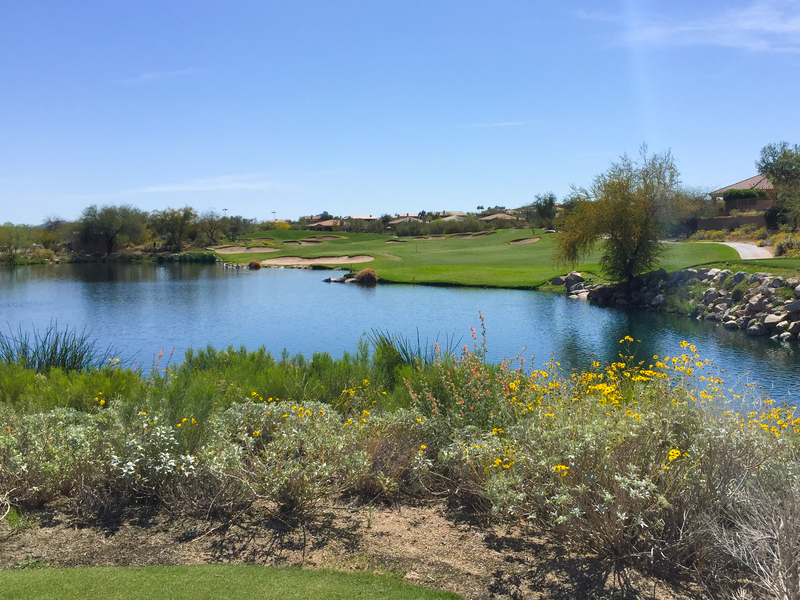 So I took my drop and made a double-bogey putting on the slickest, gnarliest green in Fountain Hills. Still, you can’t beat that view off the tee. Layout: B+; the friendly holes are very friendly, the wicked holes are very wicked. Amenities: B+; a nice driving range, and the halfway house is well stocked. Difficulty: B; 66% of the golf course is pretty manageable. After that is when the difficulty rating goes into overdrive. Scenery: B; loads of desert views and the place looks manicured and really great right now. Value: B+; in this part of the country in the spring, $109+tax is a downright steal. Compared to its $200+ neighbors, this course more than satisfies. It’d be an ‘A,’ but I just don’t like paying triple digits for golf. Overall GPA: 3.3 (B+); this place is barely twenty minutes from my house, I’ll be back. I need another crack at breaking 80 here. The course looks like a fun challenge, I’ll have to keep it on my radar for when I’m in the area!